"For centuries, many Chassidic, Sefardic and other Jews have been learning the sefer Chok L'Yisrael. This is a daily portion of Torah, Nevi'im, Kesuvim, Mishna, Gemara, Zohar and Halacha. A piece of Mussar was later added as well. It's arranged on a daily basis, and according to the parsha of the week. The Navi part usually matches up with that week's Haftara, and the Zohar is usually on the parsha of the week, with some exceptions such as Shovavim and the Three Weeks. You might want to look into that." Recently, I reconsidered Yitz's suggestion and discussed it Chabakuk Elisha and with Rabbi Lazer Brody, both of whom encouraged me to do just that. With the combined agreement of a Modzitzer chassid, a Lubavitcher chassid, and a Breslover chassid, how could I disregard this advice? I ordered a copy of Volume 8 [Parshas Chukas to Parshas Masei] and began learning it on Sunday. Chok L'Yisroel does not have the universal recognition today as Daf Yomi. To be honest, before Yitz commented on it, I had never heard of it. I asked Rabbi Tal Zwecker, a Clevelander chassid, why Chok L'Yisroel is studied primarily by Sefardic Jews and not more widespread today amongst the Chassidic world, given the fact that it was instituted by the Arizal. "Although Chassidim follow many practices and customs based on the Arizal, I believe that most Sefardim today actually follow many more. So whereas the Gaon of Vilna, himself a great Kabbalist, rejected changes in law and practice based on Zoharic and Arizal custom when they changed previous Ashkenazi law and custom, the Sefardic gedolim accepted, instituted and incorporated and changed Sefardic law and custom with Kabbalistic emendations to the Siddur, and halacha in many cases (but not all cases - for example they never adopted the Arizal's changes to the writing of Ashurit script in writing sefer Torah, Tefilllin and Mezuzos and till this day follow the Shulchan Aruch's formula whereas Chassidic custom does follow the Arizal's letter system). Chassidim became the Ashkenazi exception to the rule and when the Baal Shem Tov adopted the Arizal's nusach and many (but again not all) Kabbalistic and Arizal customs Chassidim became that exception. The Komarna Rebbe teaches in Shulchan haTahor that since we are in fact Ashkenazi that the Baal Shem Tov adopted a new path to the Arizal beginning with Nusach Ashkenaz and adding Kabbalistic changes based on Sefard and leaving many Ashkenazi customs in place (not sitting for Blessings like the donning of Tefillin, Yishtabach etc. where the Arizal holds one should sit, all poetic liturgy from Selichos to Piyutim in the Machzor follow Ashkenazi traditions not Sefardic, the Haftorahs read follow Ashkenazic custom even where Sefardic custom differs as we are still Ashkenazi). The Chabad school for example adopted the Arizal nusach to a more exclusive degree and their nusach of prayer resembles the Sefardic rite even more then some other Chassidic versions of Sefard. As for Chok L'Yisrael specifically, I cannot explain the trend, however it is clear that today many more Sefardim study this then do Ashkenazim." "First of all in Hungarian circles the learning of Chok is pretty widespread. Here in Williamsburg where I live, there are many Chok shiurim. The Divrey Chayim learned chok and since most Hungarian Hassidim have a connection to Tzanz that may be the link. Also in the hanhogos in the beginning of the "Sheeris Yisroel" the learning of Chok is highly praised, especially during the time of Shovevim. As for its popularity, somehow the learning of Chok is not very flashy, and the Chok learner are mostly elderly people. When people in China start doing Tai-Chi, is when people in Williamsburg start learning Chok." Finally, on a side note, I am curious to find out how others are able to maintain their daily learning schedules, especially people like me who work a full-time job and also have small children at home. I find it easiest to learn on my commute to work and on my lunch break. However, on Sundays it is very difficult to find time. While I used to wake up early on weekends, this strategy appears no longer to be effective. Once we brought the new baby home, my two year-old son went from sleeping until 7:00 am to 5:00 am; waking up early to see the new baby. It should be noted that Bostoner Chassidim put on their tefillin while seated. They -- and Slonimer Chassidim -- also do Hagba'ah before reading the Torah, and do not make the bracha before reciting half-Hallel. These are all Beis Yosef, essentially Sefardi, customs. [True, most other Ashkenazim don't have these customs]. It should be noted that here in Israel, and especially in Yerushalayim [and a little bit in Tiveria and Tzfas], the Ashkenazim have taken on some of the Sefardi customs. A quick example that comes to mind is that we say Psalm 121 [Shir La'Maalos] before Aleinu at the weekday Ma'ariv -- al pi Minhag Yerushalayim. There are more. Seder HaLimud - that's a biggie. Most people today go for Daf Yomi, although many of us find it too rigorous. There is another system called Amud Yomi [one side of a page a day] which is easier to maintain, but harder to find shiurim. I would suggest a daily chavrusa or shiur Gemara, there's nothing like it. But it must be "chok v'lo ya'avor" - to be kept at [almost] all costs. Sundays should be time for MORE learning, as you have that day off from work. What happened? For example, Rav Avigdor Miller zt"l established the "Torah Center" in his shul in Brooklyn, and Sunday there are shiurim all day long. ASJ,How could I forget? In Eretz Yisrael, the Kohanim "duchan" [priestly blessing] EVERY day. Also, basically a Beis Yosef minhag. There are some exceptions to this in Tiveria & Tzfas, I believe according to the Vitebsker, they only duchan at Musaf on Shabbos and Yom Tov. You can probably check that with CE. I have been learning Chok Lyisrael for more than 4 years. It has alwayys been my fall back. Even if i wasnt able to learn to much else I always feel the Shleimus of learning from every part of torah. It has given me the chizzuk to look foward to the next day of learning. I am of Litvish Background .But My mother is Sphardi. Al Titosh Toras Emecha. Yitz: You certainly cited lots of minhagim. Perhaps Chabakuk Elisha could comment about the Vitebsker as you suggested. Sunday is difficult because of family obligations and keeping small children occupied during the day. Yaakov Shalom: It is interesting that you mentioned the feeling of shleimus you get after learning Chok, since this is precisely what I wrote to Yitz in an e-mail the other day. I find that I get more satisfaction out of this learning seder than anything else I have tried. Thank you for commenting. It is also nice to know of someone else out there learning the same pages as me each day. You guys might just inspire me to get back to the Chok myself!!! ASJ, you should try to find a way to get at least the same hour or whatever of learning on Sundays, when you are not occupied with earning a parnasa, as you do during the rest of the week. Also, don't forget Shabbos! Yitz: Go for it! On Sundays I wake up before anyone in the family so I have a nice quiet house to learn. Thanks for this post. 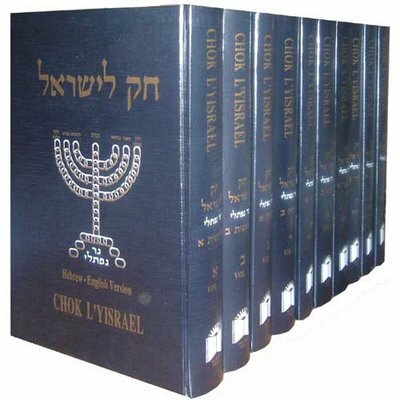 I did not know about the Chok L'Yisroel before you mentioned it here, and based on what I saw at eChok.com, it seem like a wonderful sefer. In fact, this post is really two in one, as it contain a very interesting bit on what parts of the Ari's minhagim chassidim actually adopted. Good stuff. As for learning, I actually find that easier to make time for than hisbodedus. Perhaps it is because sitting down to study a sefer signals to my wife and child that "daddy's learning, so don't bother him unless it's important", but does not entail isolating myself from them in the same way locking my self in a room or taking a long walk with the cellphone off, does. Fedora Black: I am glad you enjoyed that posting. Indeed it is a wondeful sefer. As for hisbodedus, it is sometimes difficult to consistently make time for this important practice. Biala chassidim also don tefillin while seated. Biala and Rizhin (Boyan, Sadigera, etc.) do hagbah before leining. Rizhin do not make a brachah on half-hallel. I see a lot of Hungarian (Satmar, Pupa, Spinka, etc.) baalei batim learn Chok right after davening - especially with today's pocket size versions that fit so conveniently in one's tallis bag. Why isn't the Zohar translated in the Chok L'Yisrael? Can you help me with the Kavanos that one should have in mind before each day. Theres a short inscription before each days chok and I am lost. I realize this is a very old post, but I just heard from one of the guys in my Shul who learns Chok that there is a prohibition against translating the Zohar. I do not know the source. One elementary question. If you study Hoq LeYisrael, what do you do when the week has a double parashah?